It’s been a full week of grilling here on Simple Bites and what a delicious week it has been! There is nothing better than heading outside to cook dinner when the weather turns warm. Our family loves traditional grilled fare like hamburgers and hotdogs, but what we really enjoy cooking on our grill during the summer is seafood. There is something about the lightly enhanced smokey flavor of grilled seafood that makes it seem like the ideal summer meal. We love all kinds of seafood on the grill – shrimp, tilapia, tuna steaks – but the one fish that we can’t get enough of is grilled salmon. Salmon has the perfect amount of natural fat to leave it flaky and moist when prepared on the grill. Salmon is also an extremely versatile fish making it a great addition to your weekly menu. The ingredients can easily be changed to suit the flavors you are craving the most. The salmon recipe I am sharing today is cooked on a cedar plank, which enhances the salmon with a smokey grilled flavor like no other. Cedar planks can be purchased at your local grocery, warehouse or specialty shops and preparing them to be used on your grill is simple. Once you have purchased your grilling plank and are ready to use it, rinse it off under warm water to remove dust and residue. Next, fill your kitchen sink half full of water. Submerge the cedar plank all the way into the water. Use a heavy item (such as a full wine bottle, filled cup, etc) to hold it in place at the bottom of the sink. Soak the plank in the water for at least 1 hour. 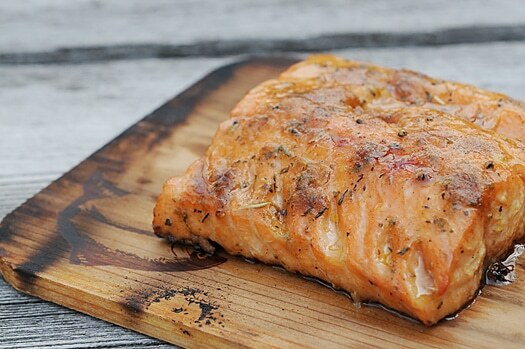 After the cedar plank has soaked for the appropriate amount of time, and once you are ready to grill your salmon, place the plank on a pre-heated grill for 5 minutes, or until it begins to smoke and crackle. Your cedar plank is now ready for grilling. Add your salmon and enjoy! Place the cedar plank on the grill grate for 5 minutes. In the meantime, combine brown sugar, olive oil, Italian seasoning, smoked paprika and Kosher salt in a small bowl. Place the prepared salmon onto the cedar plank, what would have been skin side down. Grill for 30 minutes, or until salmon turns light pink in color and is flaky. What is your favorite seafood to cook on the grill? Kristen, can you get more than one grilling out of a cedar plank? I have used my cedar planks two times now and still have the great taste. We use our grilling planks twice if they don’t get too charcoaled! The key is to occupy the plank! Yes, be sure to soak as directed. We love salmon on the grill, too, but have never bought the planks. They seem too expensive! I found a recipe at Epicurious.com years ago- just grill the salmon and when finished, put lime zest on the fish and serve with a garlic, lime juice and butter sauce. It’s so simple, easy and delicious. PEOPLE: You don’t need some Expensive Over Glorified Plank. Cedar is Cedar. Go to home depot and get a cedar fence board for $2 and cut it to size. You’ll get 6 or 7 planks that work just as well! The problem with that is that is that they’re not treated for food. If you buy them in the store (generally by pairs) they tend to be pretty cheap. Love cooking salmon on a cedar plank! My favourite summer method. And your salmon looks as enticing as any I’ve seen! Love that salmon! Simple and delicious! !This was the first time that we have ever had salmon and it was just delightful! The brown sugar and dijon work perfectly together to make a delish topping that really gave the fish flavor. I would love to know where you get this cedar plank. (I live in France) Meanwhile I will be BBQ mine, until I have done some investigating. We get ours at Sam’s or Costco, but they can also be found on Amazon.com. Just do a search for Cedar Planks and the options will come up. Enjoy! Thank you for a FABULOUS recipe. This was my first time with a cedar plank and it turned out absolutely great with awesome flavor and moist flaky salmon. It has edged in front of my maple orange glazed recipe as the favorite way to cook salmon in the house! I cannot thank you enough for this, having been the recipient of a plank that came with no instructions whatever. I love the confidence of the giver, thinking I’d know what to do, don’t you? Thank you, thank you! Do you close the lid while it cooks? Sounds delis hand I’m ready to cook! 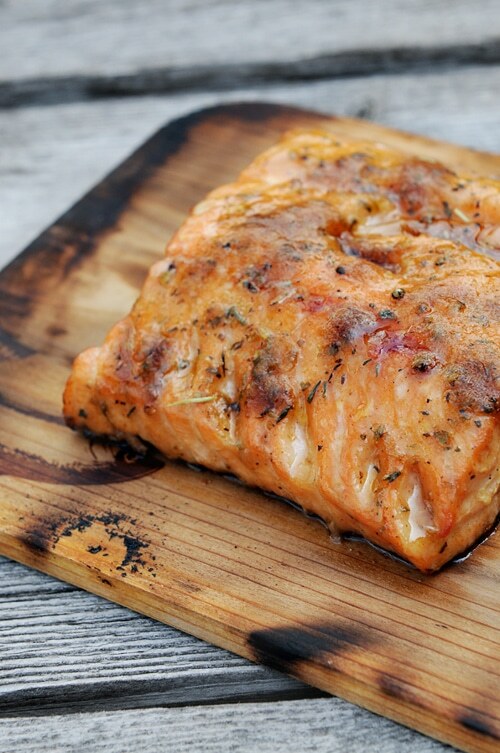 I love cedar plank salmon! Be careful using cedar wood from a home improvement store. A lot of the wood/lumber has been treated with chemicals, varnish, paint, etc that might be unseen by you-since this type of wood is not usually used for cooking purposes. Always use cedar planks that say they can be used for preparing food. Home improvement stores often have these planks in wrappers in the grilling section. Then enjoy some delicious salmon! This is an awesome recipe! We love it here at Outdoor Gourmet! Keep up the good work Kristen!